Demand for eel in Asia has held steady despite the 2011 tsunami in Japan that wiped out many local eel populations and a recent European Union ban on eel exports. With Asian and European eel off the market, the American eel has became a sought-after alternative. In November 2014, the International Union for the Conservation of Nature (IUCN) decided to place the American eel on their red list of endangered species citing decreased American eel population numbers and increased fishing pressure on the American eel stock. This decision followed a series of measures enacted by the U.S. government to reduce eel fishing. Scientific American covers the story here. On December 1, 2014, Scientific American placed an article by Annie Sneed on its website, titled “American Eel Is in Danger of Extinction”. The article reported a decision by the International Union for the Conservation of Nature, usually abbreviated to IUCN, to place American eels on their Red List of endangered species. Rather than evaluating the decision by the Union as a claim or hypothesis, the magazine appears to have accepted the listing as the correct decision, i.e., accepted the claim that American eels are in danger of extinction as true. Other writers have made the claim that American eel is in precipitous and dangerous decline. D.H. Secor (2015) made the hyperbolic statement that, “American eel…has been in freefall for the last two decades, with continental phase juveniles declining threefold or more…”, citing the the 2012 stock assessment conducted by the ASMFC’s American Eel Stock Assessment Subcommittee. A new threat to our commercial eel fishery, which has every appearance of a stable, sustainable fishery, has emerged due to the IUCN’s listing of American eels and that is a petition to list them with CITES, which could make the eel exports difficult to impossible. My approach is to consider the IUCN listing decision as a claim or hypothesis that should be evaluated in light of the available data. In the report announcing the Red Listing the IUCN did not present data or analysis to justify their decision. (Jacoby et al. 2014). Instead, the report contains a discussion of available data, especially the 2012 stock assessment and the 2006 and 2012 reports of the Committee on the Status of Endangered Wildlife in Canada (ASMFC 2012; COSEWIC 2012). There has been a well-documented and severe decline of the eel stock in Lake Ontario, of course, but the meaning of this specific decline for the species as a whole is not clear. The IUCN report states that abundance is now increasing in Lake Ontario. Initially, the claim that the American eel is endangered by extinction was surprising to me, and to many other biologists I talked to in the Mid-Atlantic region who conduct fishery field work, especially in freshwater streams and rivers. Eels seemed to them to be very common to abundant. The region also has an ongoing commercial pot fishery for eels which has produced stable landings since the mid-1990s (Figure 1). Figure 1. Total commercial landings (in pounds) and value (in millions of dollars) of yellow eels along the U.S. Atlantic Coast, 1950–2012. In 2013, for example, 85% of American eel landings on the Atlantic coast occurred in the states from New York south through Virginia, a common definition of the Mid-Atlantic region, which often includes Virginia because it shares the Chesapeake Bay with Maryland. Smaller eels are sold for bait to recreational striped bass fishermen, while larger eels are exported to Europe or Asia, where they are considered delicacies. Note that except for a very few eel weirs, commercial fishing for eels occurs in tidewater. A large proportion of eels live in non-tidal freshwater and are protected from commercial fishing; this proportion of the stock is not part of the stock assessment. For example, Horwitz et al. reported fish community sampling results from streams in the Delaware River drainage at the AFS meeting in Portland. Eels were not present in all stream reaches due to waterfalls or due to a subset of dams that appeared to block access, even though eels were able to migrate past many dams. But in the majority of streams sampled with eel access, eels made up from 30% to 40% of the total fish biomass. Before a fish species could be in danger of extinction, it would become so uncommon that it would be considered commercially extinct, i.e. a directed fishery would become financially unfeasible. That has not happened. One component is an estimate of fishing effort in terms of recreational fishing trips, based on a telephone survey. The second component is a survey of recreational fishers in person at access points as they either fish or return from fishing trips. This component estimates the catch rate for a species, or the number caught per trip. To estimate the total catch of a species, the Program multiplies the estimated catch per trip by the estimated total of trips. To develop an index of CPUE or catch per unit of effort, the estimated total catch is divided by the estimated number of trips to recreate the catch rate from the Access Point Intercept Survey (R. Andrews, NMFS, personal communication). The catch per trip estimates for American eel is affected by the fact that the Access Point Intercept Survey of angles has been conducted only in daylight hours, whereas American eels are a nocturnal species. This mismatch must reduce the “catchability” of eels by this survey; the survey, however, should still be a reliable indicator of trends in abundance. Starting this year, 2015, the Survey will add night-time sampling, which will probably increase the catchability of American eel. Eels are surely an unintended bycatch for recreational anglers. They are difficult to unhook and are rarely eaten in this country. They are caught almost exclusively in estuaries, denoted as “Inland” waters by the NMFS Program. Each year, there are scores to thousands of angler interviews conducted in the estuarine waters of each state along the Atlantic coast, so the sample size is quite large when interviews from all Atlantic cost sites are pooled. The estimated total number of recreational fishing trips in Inland waters of the Atlantic coast was about 15 million in 1981, increasing steadily until it had doubled to 30 million by 2008, when the Great Recession hit and the estimate of trips then declined to 23 million by 2014. Figure 2. 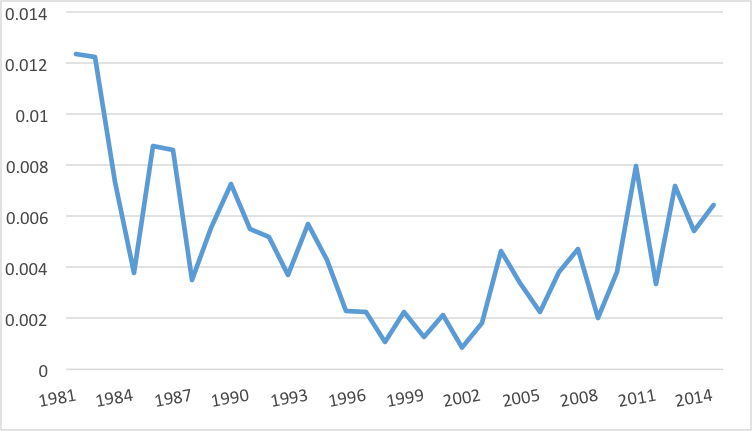 Estimated number of angler trips in the inland, or estuarine waters of the Atlantic coast of the U.S. from 1981 through 2013. Source: Marine Recreational Information Program, National Marine Fisheries Service. The estimated mean total catch, including discards, in the recreational fishery in inland waters in 1981 was roughly 170,000 eels. The catch estimate declined irregularly until its nadir during the period of 1995 through 2002, when the catch ranged from 24,000 to 55,000 eels. Beginning in 2003, total catch began an increasing trend with fluctuations, approximating 150,000 eels in 2014. To recreate the catch rate from the Access Point Intercept Survey, I divided the total catch per year by the total trip estimate to obtain the catch per trip (Figure 4). This index shows that for the period 1981 through 2014, abundance was at its peak in the early 1980s. Abundance then declined irregularly until the mid-1990s, when it leveled off until 2003. 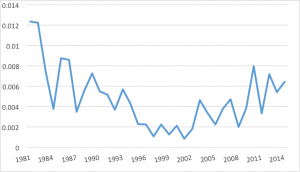 From 2003 to 2014 eel abundance began to increase with fluctuations. The index indicates that by 2014, abundance had climbed to about half of the level in the early 1980s. Figure 4. Estimated catch-per-trip of American eels in the recreational fishery of the estuarine waters of the Atlantic coast of the U.S. from 1981 through 2013. In conclusion, if the American eel was in danger of extinction, its abundance would have declined recently or would have been very low for the recent period. In fact, the relative abundance on the Atlantic coast, as indicated by a large-scale survey of recreational anglers, has increased since 2002. Second, to assess the absolute abundance, we can see that roughly one million pounds have been landed annually for the last fifteen years. These facts are inconsistent with the claim by the International Union for the Conservation of Nature that the American eel is endangered. That claim, or hypothesis, should be rejected. Desmond Kahn has served as President of the North Eastern Division of the American Fisheries Society and of its Mid-Atlantic Chapter. He has also served on the Governing Board of the American Fisheries Society. He was Chair of the Oscar E. Sette Award Committee of the Marine Fisheries Section of the AFS for 11 years. Contact him here. Dear mr Kanh ,reading this post I can not help but to think ,here we go again , another study but no real hands on ,just papers,I have bought eels for the last 35 years ,in the US and Europe,and have seen the real trends of the eel industry and it is pretty steady right now ,I will give you a prediction that within the next 5 years the US yellow eelfisheries will be unprofitable due to pricing and effort ,already the decline in effort is tremendous due to low prices and high cost of fishing ,the few eelers that are fishing now are catching more than I have ever seen before ,so there is an abundance ,the market will dictate where this goes ,at the moment downhill ,not for the reason that you all put on paper. Kind regards. Martie Bouw. A P chair. For the eel board . Dear Mr. Bouw, I am reminded of Ronald Reagan’s reply to Jimmy Carter during their Presidential campaign debate, “There you go again.” I am not certain of your point. You seem to agree with the result of my research that eel abundance has been increasing when you wrote, “the few eelers that are fishing now are catching more than I have ever seen before ,so there is an abundance…” My point is that the claim of the International Union for the Conservation of Nature that American eels are endangered with extinction is not upheld by te available data. You fail to address that central point. Instead, you address the economic viability of the fishery, I believe. Could you please comment on m central point? Thanks for your important work on this subject. When the IUCN renders a decision that is directly contrary to not one but two successive findings of the U.S. Fish and Wildlife Service, stakeholders benefit from critical scrutiny such as you are offering here. You point out a serious flaw in the ASMFC stock assessment that was so heavily relied on by the IUCN panel. Nice work! I would point out there is an equally serious flaw in the IUCN report itself. Specifically, the IUCN makes a highly misleading claim that eel recruitment has trended down over the last several decades. This contention is supported almost exclusively by a mere two data sets, i) the Moses-Suanders index, which is not measuring glass eel recruits, but rather juvenile eels that have already been subjected to hundreds of miles of upward migration, predation and habitat challenges; and ii) a long term young of year index of eels on the Hudson river derived from a striped bass survey in which less than 1 eel is recorded per sample. By contrast, the IUCN gave short shrift to the longest running glass eel survey in North America, the East River Nova Scotia index, which IUCN knows reflects upward trends in glass eel recruitment over a period spanning more than two decades. Even more odd, the IUCN ignored the complete body of east coast young-of-year surveys that have been mandated by ASMFC since 2000. These indices reflect a high degree of stability; some states, such as Delaware, are counting hundreds of thousands of glass eels every year in dedicated glass eel surveys. When asked why they failed to include the ASMFC young of year surveys, the IUCN authors responded that they did not consider fishery-dependent data. Sadly, the IUNC authors did not realize that the ASMFC surveys are fishery-INDEPENDENT. Even more sad, after their mistake was pointed out by outsiders, they took no action to modify their conclusions or any aspect of their work. It is not surprising that the subsequent decision of the US FWS contradicted the IUCN report and that CITES was unable to garner support to even propose the inclusion of American eel on any of the CITES appendices. Interested stakeholders should not be surprised when, hopefully, the Canadian Department of Fisheries and Oceans similarly rejects the call of COSEWIC to list the American eel under the Canadian Species at Risk Act.